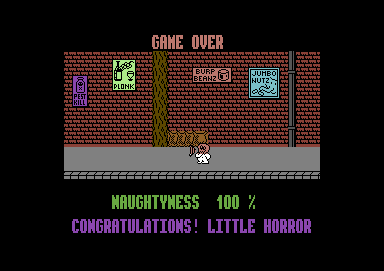 Publisher Gremlin Graphics Software Ltd.
5.3 How do I get the full 100% on the Naughtyometer? 7.33 points at 24 votes (rank 251). 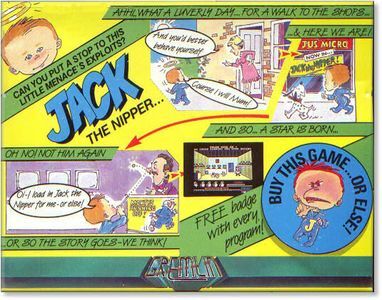 Finally a refreshingly different game: In "Jack the Nipper" you steer a baby through the kindergarden, police station, museum, side streets and allotments. During this you aim to miss no opportunity for mean tricks without getting caught by the victim. So you run swiftly between the adults, put the most unbelievable items into the small pockets of the rompers, throw plates from the shelf, kill ghosts with the pea-shooter, overdraw mum's credit card and help criminals to a mass break out. The aim is clear: to become the naughtiest baby of all times! "Jack was tired of all the whimps in his town, the boring games and goody goody ways to send him to sleep. So, Jack being of a rather naughty disposition set about livening things up a bit, he picked his trusty pea-shooter and scapered off to cause some trouble. " The aim of the game is to make the Naughtyometer climb to 100% by using the found items correctly and without getting spanked five times until then. You count as spanked when Jack's Rash scale reaches the maximum by touching adults or other enemies. "This is where you come in to take the role of Jack and use your imagination to be as naughty as possible doing the things you always wanted to but dare not (YOU WIMP!!). Jump on things, pick them up and drop them, use your pea-shooter to create smashing effects and toot your horn at the cat. Use the items you pick wisely then you must work out where you have to drop them to cause ultimate havoc. For instance what could you do with a tube of glue?" Jack is steered through a 2D world in which the single locations are drawn as Hires images. There is not scrolling - the screens are "turned over". Jack himself is a cute Hires sprite, all other people and items are realised as 4-coloured Lores sprites. This mixture works excellent and adds much to the cuteness factor of the game. Sound and music are on a "nice" average level. There are a few well made and fitting sound effects, as e.g. 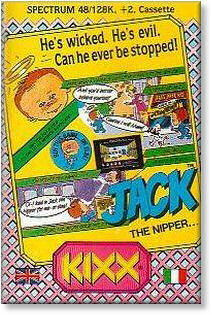 Jack's whistling and the strange sound when a trouser bottom met his maker. The few music pieces of the game are rather saucy and let Jack dash snappily through the screens. Jack is either controlled with the keyboard or the joystick in port 2. Pushing the joystick into one direction + pressing the fire button makes Jack jump into the desired direction. While standing on even ground Jack uses the blowpipe or hoot, if available, when the fire button is pressed. Otherwise he will jump up. Jack collects items by standing next to them and pressing 1 or respectively 2 on the keyboard to put the item into the corresponding pocket. Jack can use or put down an item by pressing 1 or respectively 2 for the corresponding pocket. Jack toddles through doors with the key RETURN . With the key M you can switch the sound in the game on or off. You activate or deactive the pause mode with H .
The key C changes between joystick and keyboard controls in the title screen. With Q you end the current game. If the controls by keyboard are chosen then Z is for left, X for right, : for up and ? for down. A happy Jack (corrresponds to each one "life" left). A spanked trouser bottom (corresponds to each one "life" lost). The Rash display (how many smacks can a baby bum take?). The Naughtyometer display (the higher, the naughtier). Jack's two romper's pocket's (currently empty). Jack‘s true antagonists are of course the adults! If you do a trick on them, their faces turn purple from rage, they storm towards Jack and try to stay with him to give him a flogging. This means for Jack a quick rise in the Rash display until he is spanked. Jack should also avoid ghosts, crocodiles and other exotics as carnivorous plants, teeth and soap bubbles. However, they can be usually destroyed with the help of the pea-shooter. You should do this in any case with the ghosts, as some of them have the awkward feature of not leaving Jack’s side any more! Also babies and dogs make the Rash display raise up. However, they never get angry at Jack. Nevertheless, there are some babies who do not want the leave Jack’s side. And then there are also the cats. If they are sitting silently in the corner, they should not be touched! But other than dogs you can annoy them! There are three street sections (one of them separated by a small park) that are connected to each other by side streets. From the streets you enter each shop or house. The park lies in the third street of houses and offers next to the possibility to do tricks but also access to the house of Jack’s family. Shops and houses consist of one or more connected rooms. In those the bigger part of the tricks will be done. There are two secret rooms. They are hidden behind the radiators in the museum and in the bank and lead to otherwise unreachable places. They are build up as screens of a classic Jump 'n' Run game. 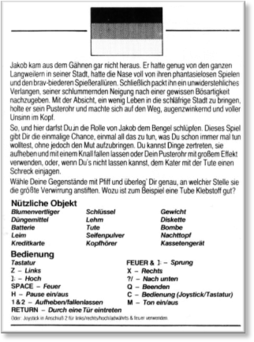 Jack can collect 19 different items in the course of the game (some of them in different versions). Some of them can be used several times, some need to be combined and others should be destroyed on the spot. Partially, the items cannot be recognized from the image. This counts for the credit card that looks like a book and the clay, which also looks quite different... The battery even seems to be recognized wrongly in the manuals – it is more probable that this is a magnet! Furthermore, there are items that cannot be collected as e.g. radiators (doors of the secret rooms), flowers or conveyor belts and computers. But these objects can be used if combined with other items. But be careful: objects as radiators and conveyor belts raise Jack’s Rash display! The pea-shooter lies just in the starting room on the shelf. With it you can keep annoying creatures at bay. Furthermore, you can collect a few percentages on the Naughtyometer, if you shoot at adults. The Walkman lies on the sideboard in the room next to the starting room. We put the Walkman and the headphones together into the pockets. This does not only raise the Naughtyometer because we irradiate our surrounding acoustically without asking them, but lets us also play from now on with brisk background music by Ben Daglish. The headphones lie in front of the "Just Micro" shop. The credit card lies on the closet in the dorm. You only reach it by the secret passage! With mum’s credit card we blow up, ehr: jump against the bank‘s ATM. You find the clay in the "Just Micro" shop. We give the clay to the two kids in the 2nd room of the "Playskool". Beware! Unpleasant for the Rash display will they knead us a green monster! You find the glue in the "Launderette". We pour the glue on the conveyor belt of "Gummo's Chomping Molard", which makes the further production a bit sticky. The battery lies in the anteroom of the police department. We visit "Just Micro" with the battery. There we simply walk along the hard drive (?) (the green square at the left of the foot of the counter). The flower killer is placed on a shelf in the shop "I. Bloom". With the flower killer we destroy the nice flowers of the flower lover in the park. He is then so angry that he hates us for the complete rest of the game! The red key is on the lawn to the right of the cemetery. Go with the red key into the bank and drop the key when the radiator has dully uncovered the secret door. The blue key is at the left border of the lawn, just right next to the bank building. With it we open the corresponding secret door in the museum. The potty is in the first room of the "Playskool". Put the potty on the floor in the "China Shoppe". The owner seems to not like the smell. The disc waits in the bank. With the disc in the pocket we look closely at the bright blue computer at "Technology Research". The soap powder is placed between bank and dorm. With the soap powder in the pockets we walk over the three washing machines in the "Launderette". The horn is in the second room to the right after the secret room in the museum. With the horn we scare the cats in the anteroom of the police department, the "Playskool" and the living space at the left in the house on the lawn. The bomb is in the fireplace room (the third room to the left of the room with the hoot) on the chimney. Beware: The chimney makes Jack’s Rash display rise! We put down the bomb in the cell block of the police department. However, the then escaping criminals are not very thankful to you. Two plates (green and blue) are placed on the shelf in the "China Shoppe". We instantly throw plates from the shelves. There are two more plates (blue and red) in the kitchen (right room) of the house on the lawn. The vases (purple and blue) can be found in the two museum rooms. The same is for all vases. The teddy bears are on the shelves in the "Toyshop". Even teddy bears are instantly destroyed. Do a trick only when adults are as far away from Jack as possible. Some items can / must be used several times. Jack needs to be standing on flat ground to put down items. If he stands a bit higher he will throw down the item so it will break. Not more than two items can be at the same place (screen) at the same time. If Jack wears pea-shooter and hoot at the same time, he will only use the hoot when pressing the fire button! Most of the people have forgotten their anger when you re-enter a place. You should chase away ghosts with the pea-shooter, as these can get very bothersome. This is especially when they are stuck between Jack and the exit. Ghosts are complete again after re-entering a place. 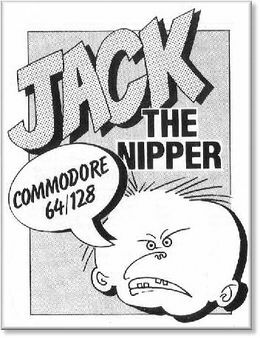 "Jack the Nipper" is one of those games, where at some places you go from room A through a door to room B and when going back through the same door you are not in room A but in room C... o.k? Secret rooms cannot be left through doors, through which you came in. If you do not want to labour through the same secret toom twice, you should enter it with empty pockets to be able to take everything with you! It is possible to play the game to 100% withouth losing even one life! After doing a trick you should not leave a room too fast. It can happen that items are lost, but points have not yet been awarded. This leads to a dead-end and the game cannot be solved to 100%. How do I get the full 100% on the Naughtyometer? Of course you need to do all tricks! So all three cats must be scared away. The (nice) plants of the flower friend have to be shot first with the pea-shooter! Only then should you throw the flower killer! 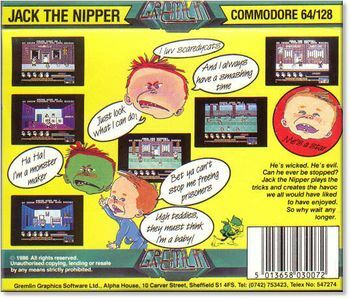 Absolutely shoot at adults with the pea-shooter until it does not affect the Naughtyometer any more (so the pea-shooter potential is exhausted). After all tricks – when no item is needed any more and you have been everywhere – drop all items that you can carry and are left from dizzy heights! This includes the keys, the pea-shooter, the hoot and all items that are left after the tricks as e.g. the battery and the disk. If you enter zapit in the title screen, you get invulnerable! The trick for the ZX Spectrum version, to sit down on the former seat of the police station’s cat that was scared away and go on hooting until the Naughtyometer is full, does not work with the C64 version! "Game critic of the Happy Computer"
Bamse: "Innovative, complex, original and cute: "Jack the Nipper" must not be missing in any collection!". H.T.W: "Although it is basically "only" an action adventure, this game is somehow a bit "different". Already the original plot makes one notice. You are supposed to make as many tricks as possible with the knee-high boy named Jack and bring a great chaos into the orderly surrounding. The success of these actions is shown on a "Naughtyometer". This alone makes one smile. When Jack does a trick and e.g. scares the cat or breaks plates, he will be chased by an adult that, if he gets you, get him spanked. As the sprites are very nicely animated and the graphics are also rather appealingly drawn, one cannot avoid grinning derisively when you scare a cat and it hangs down from the ceiling the other way round. The necessary items to do the different tricks have to be searched before that and here we are at the "normal" action-adventure. Summary: A funny, innovative game that one can recommend to everyone who likes this genre. " FXXS: "The game had a great copy protection, because you did not really know what to do here. Unfortunately, this was also not mentioned in the manual, by which the game had an unsurmountable copy protection for me as an owner of an original due to the illogical room arrangement. 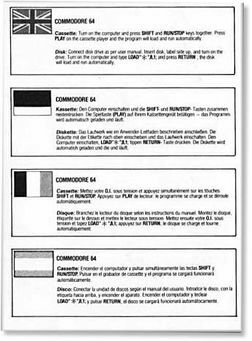 With the explanations here and the maps from C64games it probably would have deserved 7 or 8 points. But I still bemoan the fun I that escaped me at that time with the game and therefore I give 6 points." 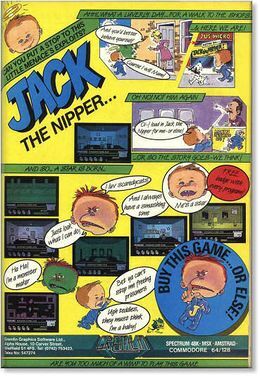 The pranks done in this game are the cause for Jack's complete messed situation in the second part "Jack the Nipper II - Coconut Capers"! The follower is already mentioned in the text scroller of the title screen. A variation of the ingame music can be found in the HVSC directory under MUSICIANS/D/Daglish_Ben/W_E_M_U_S_I_C_1.sid track 9. 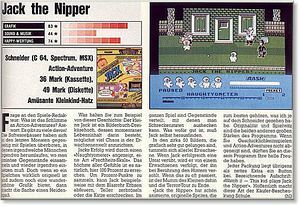 The ZX Spectrum and MSX versions (screen 1) are graphically identical.